At the end of August, our family celebrated a family reunion in Philadelphia with all of our family members on our mom’s side. The main focus was my grandmother’s 88th birthday, as well as my uncle’s birthday and visit from Korea. 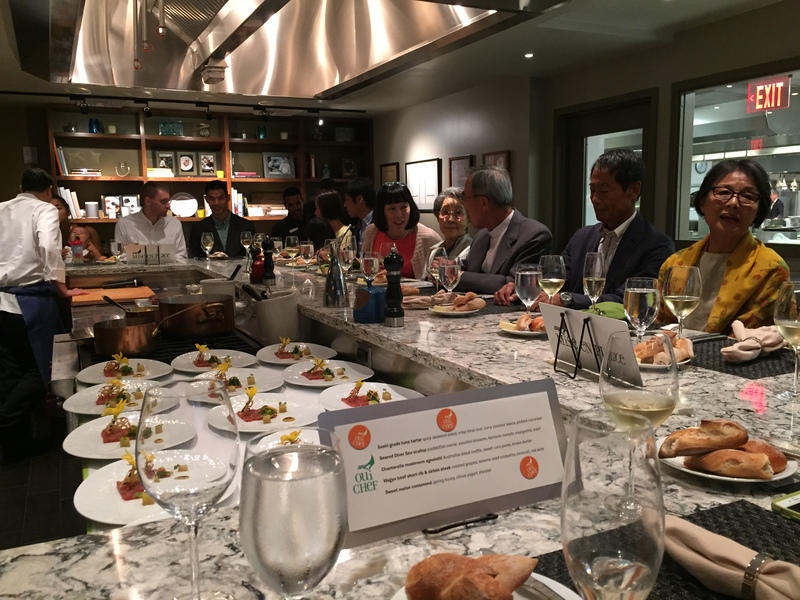 Our aunt coordinated a beautiful and indulgent dinner for the family at Mise en Place, where the chefs prepared the meal right in front of us and explained the exquisite dishes to us as they went along. It was truly a meal to remember. 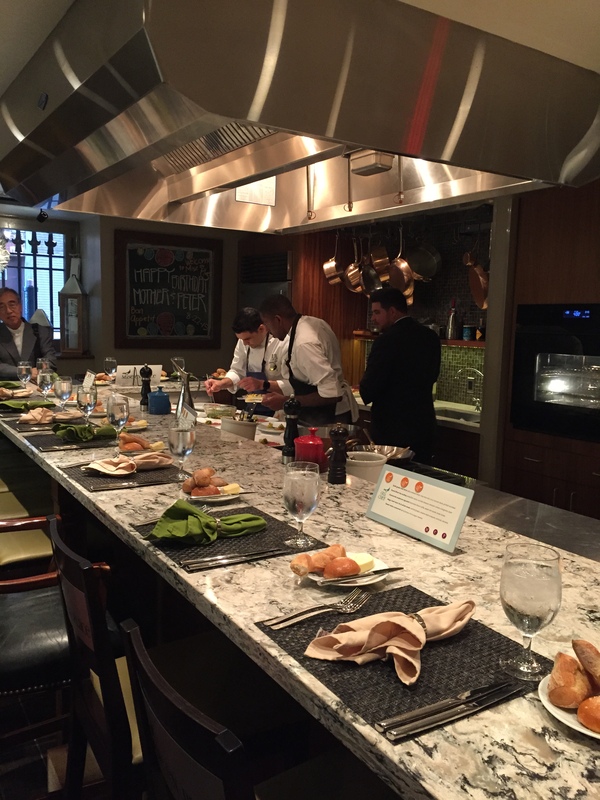 First, we began with champagne and h’ors d’oeuvres in a circular wine cellar. 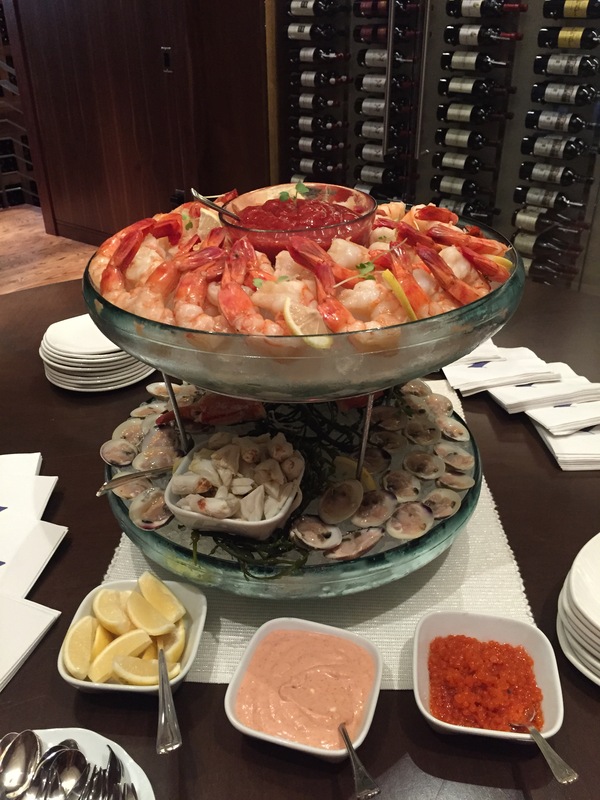 Featured on the center table when we arrived was this glorious tower of shrimp, clams, mussels, and crab and lobster meat. The crabmeat had been tossed in a delicious olive oil, and the crab itself was very sweet. 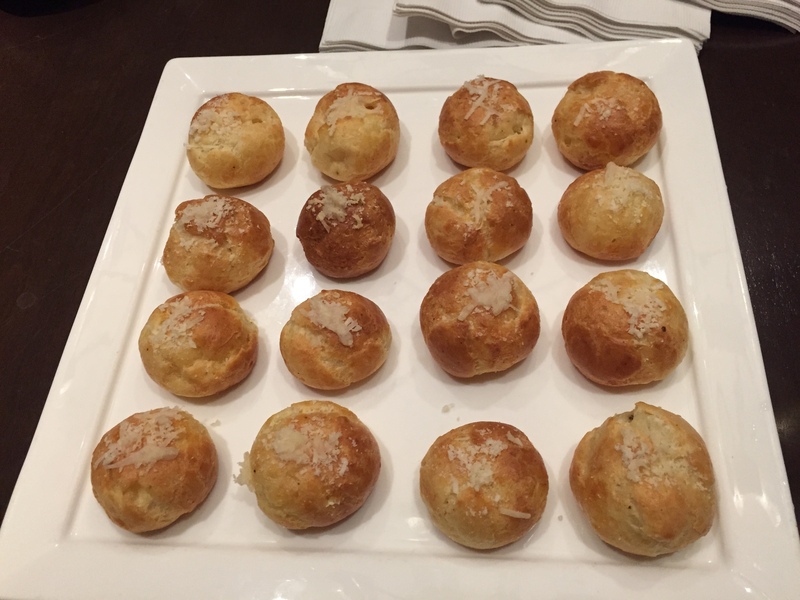 Next to arrive were light puffs of warm dough filed with cheese. 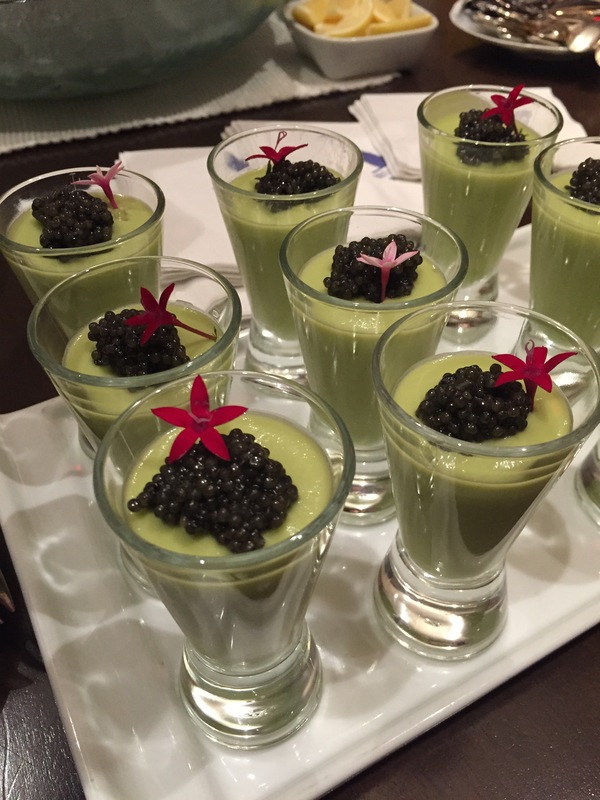 Following the puffs were these vibrant vials of some kind of loose panna cotta-like green filling (my cousin guessed it was peas), topped with a generous dollop of caviar and an edible pink flower. This was wonderfully refreshing with a great bite of saltiness and decadence. 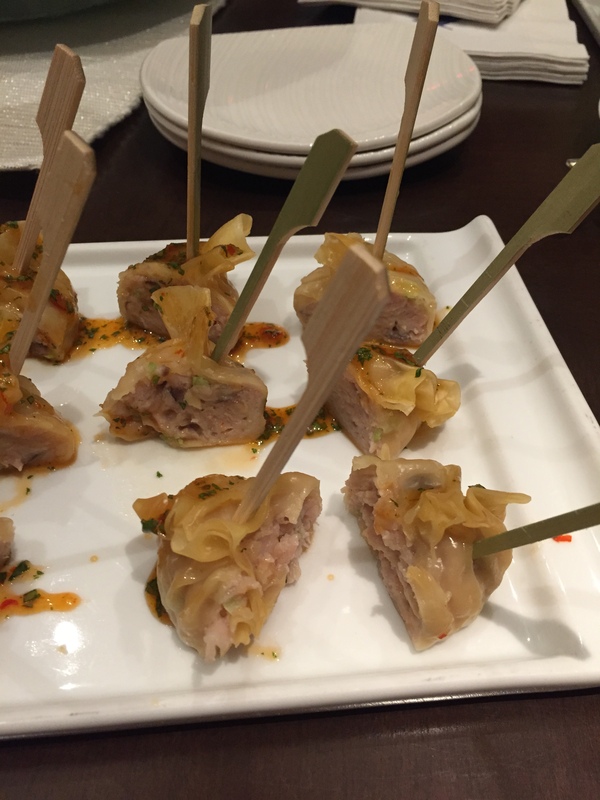 For another warm appetizer, we had chicken shumai, which were really lovely as the outer dough was thin and the filling was warm and flavorful, with what I think was some kind of sweet chili sauce. Finally, we were allowed into the main dining bar. And a view from my seat. This glorious basket of bread was waiting for us when we sat down. 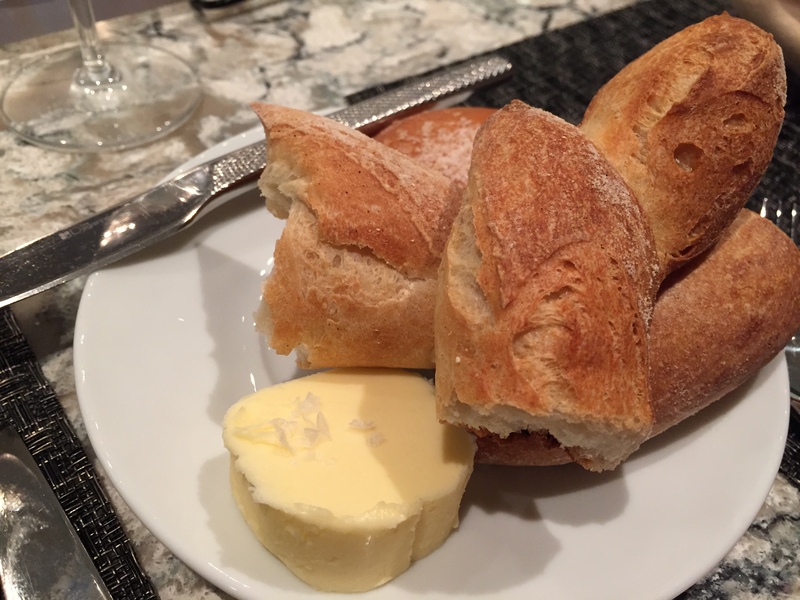 There was a round brioche bun with sea salt on top, as well as several slices of delicious french baguette. Also, I’ve become a huge fan of butter with large salt flakes on top, and so I was thrilled to see it here. 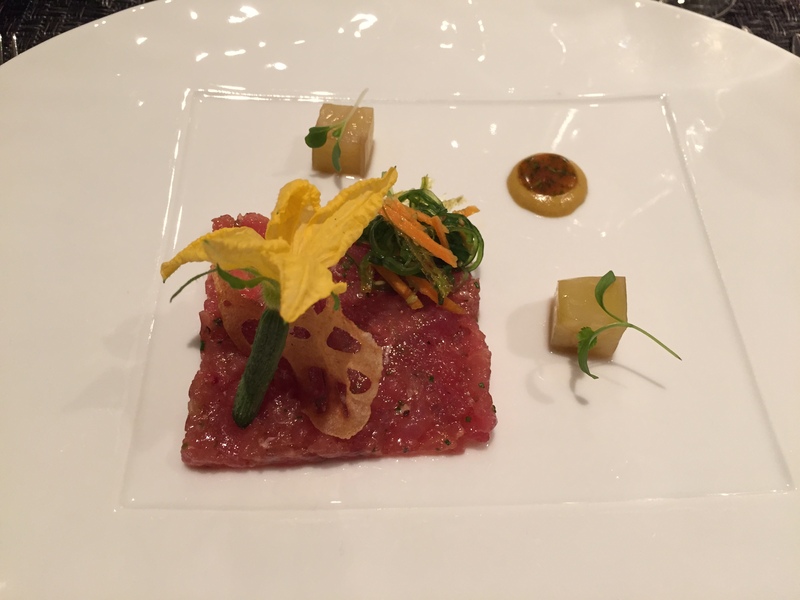 The first course was sushi grade tuna tartar with a spicy seaweed salad, crisp lotus root, curry coconut sauce, and pickled cucumber. The two squares are the pickled cucumber, and the round dollop between them is the curry coconut sauce. The blossom resting on the lotus crisp is a cucumber blossom. The pickled cucumber was a perfect contrast to the fattiness of the tuna, and the sweet and savory coconut sauce tied everything together. 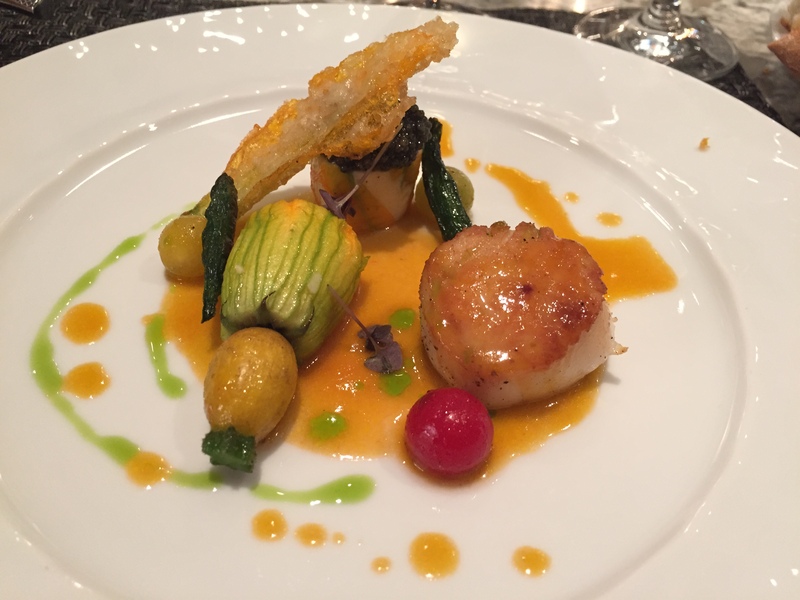 The second course was seared diver sea scallop with paddlefish caviar, zucchini blossom, heirloom tomato vinaigrette, and basil. The scallop was absolutely perfect. The squash blossom was served in two ways. First, a scallop mousse was stuffed into a blossom, and second, a blossom petal was fried. The salty fried zucchini blossom may have been my favorite part of this dish. 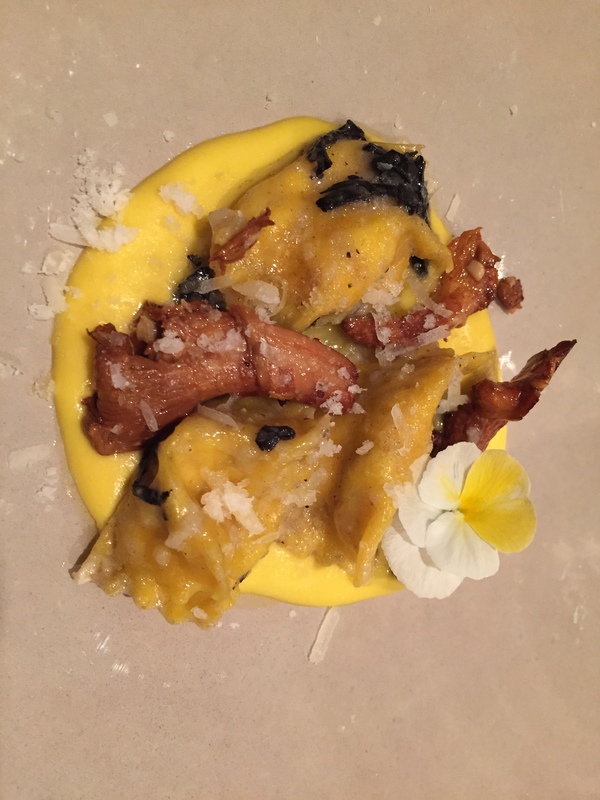 The third course was was chanterelle mushroom agnolotti with Australian black truffle, sweet corn puree and brown butter. Good gracious, the sweet corn puree was phenomenal. To that, the earthiness of the mushrooms, the chewiness of the fresh pasta, and the saltiness of the cheese garnished on top – I was wishing the dish would never end. 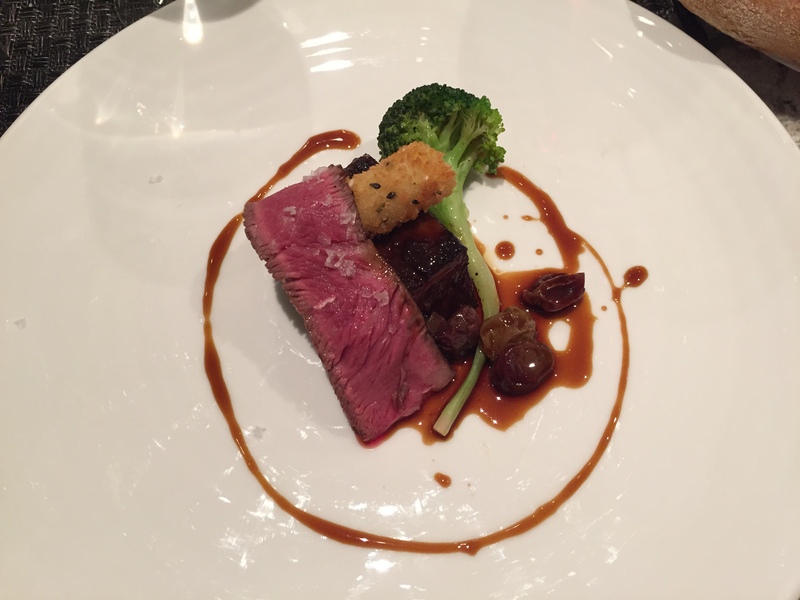 The fourth dish was wagyu beef short rib & sirloin steak with roasted grapes, sesame seed croquette, broccoli and red wine. Of course, the meat was perfect – tender, juicy, full of flavor. And the grapes added a great burst of acidity. But it was the croquette, which we learned had anchovy ground in, was so so good. It had a perfectly light and crispy crust, warmth and flavor on the inside. I could have eaten more and more. 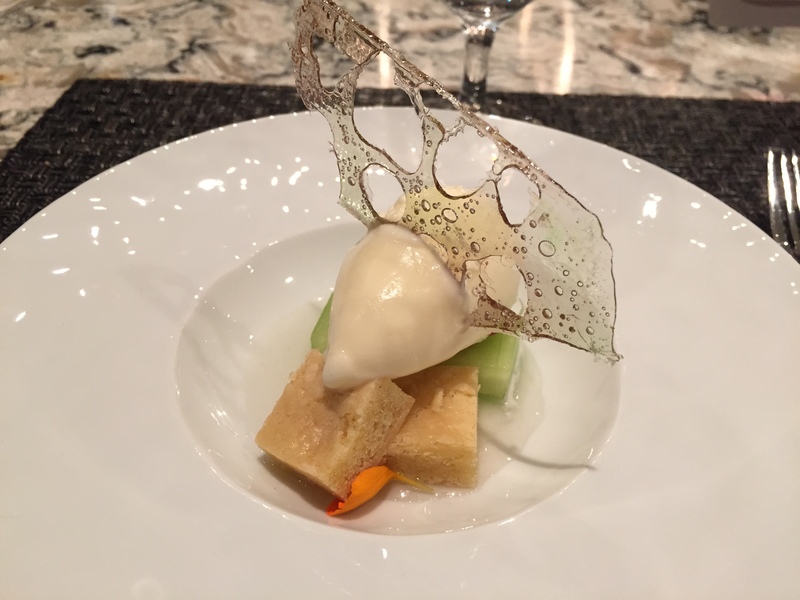 And finally, dessert – sweet melon consomme with spring honey and citrus yogurt sherbet. Just as delicious as it was refreshing, this was a perfect – and beautifully delicate – way to end a phenomenal meal.